Among the Saints listed in the Roman Martyrology on August 16th is St Roch, one of the most popular Saints to invoke in times of plague. According to the supplement to the Golden Legend, he was born in 1295, the son of the governor of the French city of Montpellier. (Modern scholarship tends to place his birth in the middle of the 14th century.) On the death of his parents, he distributed the considerable patrimony which they left him to the poor, and became a full-time pilgrim. St Roch Among the Victims of the Plague, and the Virgin Mary in Glory, by Jacopo Bassano, ca. 1575. 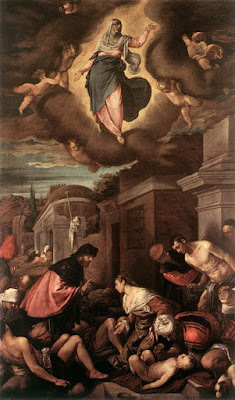 The inclusion of the Virgin Mary above refers to the fact that Roch’s feast is celebrated the day after the Assumption. The hospices which were built near many major pilgrimage centers to receive the pilgrims also served as hospitals for the poor (hence the two versions of the same word, deriving from the Latin word for guest); in Roch’s time, plague was running rampant, and he encountered many sufferers in these places, as he traveled to Rome and through various cities of northern Italy. Many of these he healed simply by making the sign of the Cross over them, until he himself became infected. Not wishing to impose any further burden on the local hospital, he went out into the woods to die, but was miraculously brought food by a dog, until its master found him and took care of him. On recovering, he continued to cure many people of the plague. When he returned to Montpellier, however, he was not recognized, and therefore arrested as a spy and imprisoned, remaining in captivity until his death five years later. When they came to take care of his body, he was recognized as the son of the city’s former governor from a cross-shaped birth-mark on his chest. A plaque was found next to the body with these words written on it: “I indicate that those who suffer from the plague, if they flee to Roch’s protection, will escape from that most cruel contagion.” A magnificent church was built, and his body laid to rest therein, where many miracles continued to happen at his intercession. 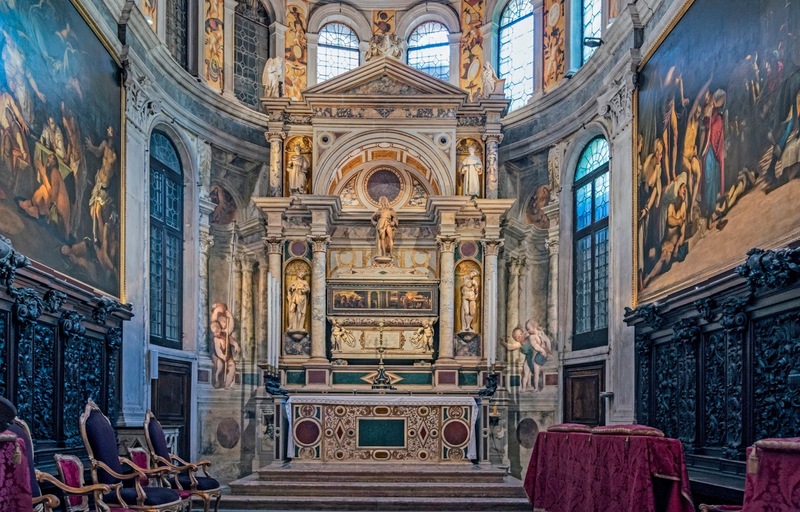 The supplement to the Golden Legend also mentions that his body was stolen by the Venetians in 1475, and enshrined in a “most renowned” church they built dedicated to him, which still exists. 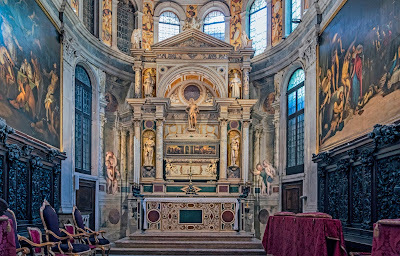 The seat of a pious confraternity named for him is located close by, and is justifiably known as the “Sistine Chapel of Venice”, filled with paintings by the great Venetian master Tintoretto. As one of the busiest ports in Europe, in regular contact with the East, Venice was a city to which new plagues (or new strains of old ones) were continually arriving; over twenty outbreaks are recorded there between the mid-14th and mid-16th centuries. 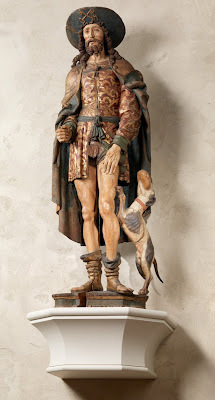 It may be that the Venetians acted from sheer desperation in stealing St Roch; on the other hand, pious thefts of this sort were a specialty of theirs, and over the years, they also managed to nick St Mark the Evangelist and St Athanasius from the Copts of Alexandria, St Lucy from the city of Syracuse, and one of St Peter’s chairs from Antioch.